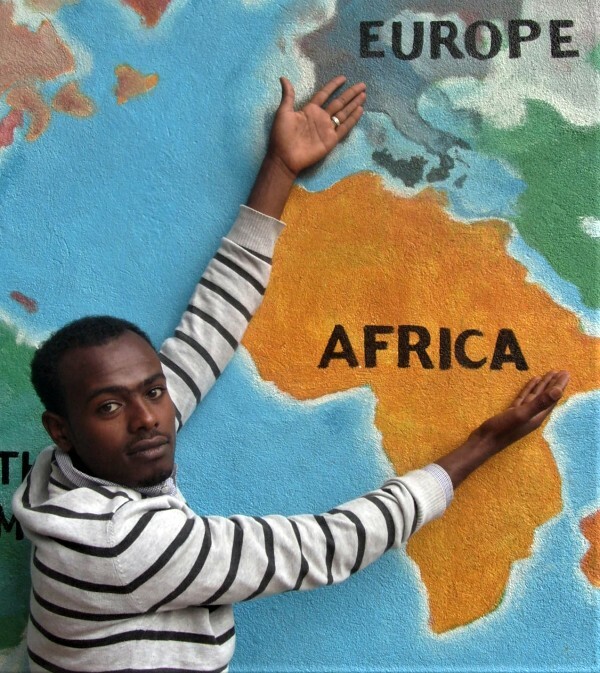 My name is Abel Yonas Zekarias and I was born in Doano, a tiny village near the small town of Durame in southern Ethiopia. I lived in this village with my family and grew up there. Doano is six kilometers from Durame. For kindergarten and elementary school, I attended St. Joseph Catholic School, three kilometers from Doano. The other school years I spent in Durame. The mountainous landscape, paths and roads demanded a lot of endurance and strength, every day at least twelve exhausting kilometers on foot. I was traveling in a small group. In 2012, the bachelor’s degree in Governance and Development at the University of Hawassa. My further studies lead to the master’s degree in 2015 at the renowned Ethiopian University in Jimma in the field of governance and development studies, with a special focus on development management. PBF made my two courses financially possible. My parents live in Doano, our father Yonas is a farmer and has been supported by PBF for many years in his beekeeping. Our mother runs the simple household and contributes a lot to the farm. Two sisters belong to our family, the older one is married, the younger one visits the school. My older brother is married, and his family has been twins for a very short time. I married Mihret Linos in 2015. We have two children, three-year-old Jonathan and one-year-old Kiyada. Jonathan visits PBF’s Abune Francis kindergarten. Jossy, my older brother, and I live and work together. So we were both in the same department at Wolkite University from 2015 to August 2018. In August 2018, I moved to Wachemo University, where I served until mid-March 2019 as a lecturer and head of the Department of Political and Ethical Studies. In 2009, I met PBF, participated in new PBF projects in southern Ethiopia, visited some Capuchin Brothers led social and educational projects in Wolaita Province. In another project of the Foundation in Addis Ababa, I am still very committed: old, lonely single people living on the street and receive in the VDI daily food and some accommodation. My involvement also includes setting up the Abune Francis school in Durame, a well project and the extension of elementary school in my village of Doano, and the monthly transfer of grants to PBF students. The improvement of honey production in Doano is very important to me. In order to continue my academic education in Europe, I have been very interested in a scholarship at the KAAD, a German Catholic institution for foreigners. For many years this is my wish, my vision, my plan, a dream that has now come true. I’m happy about that and I’m grateful. I like to remember the past weeks. On March 14, 2019, I boarded a plane for the first time from Addis Ababa to Frankfurt am Main. My last hours before midnight in Addis was an exceptionally strong experience of saying farewell. My friends, my wife, my brother and my dad have accompanied me. I still see them all at Bole Airport … Then, the next morning I reach Frankfurt, a huge airport, very complex and something completely new for me. Also the weather was so different, quite cold. Now I am to travel from Frankfurt to Bonn. The train ticket was already booked. Together with two other students from Africa, I was warmly welcomed by KAAD members in Bonn. First, I have to learn German for a few months. I like to do that and am very motivated. After my studies in Bonn I change to the University of Bielefeld. There I am allowed to start my doctoral thesis. I will write my dissertation on Migration Remittances and Rural Livelihood. I will gladly be able to write more about this later. For the moment, the title would have to suffice. In any case, my country, southern Ethiopia, Durame and improving livelihood in a rural society will be the central research topic. It was only thanks to my many years of experience in the PBF Foundation that I began to recognize the great social connections and dependencies during a good decade. They will keep me busy in these coming years. I hope that this will be possible with God’s help and advice from my academic teachers.